Football or soccer is one of the most popular sports around the world. No wonder, there are massive football stadiums all over the globe. These stadiums are measured by capacity and they have been built in almost every continent, apart from Antarctica. While Asia has six large stadiums, Europe has just five. Let's check out the largest football stadium in the world where crowds are often heard roaring and cheering. Though, it's not mainly used for football games, this stadium is the largest all around the world. 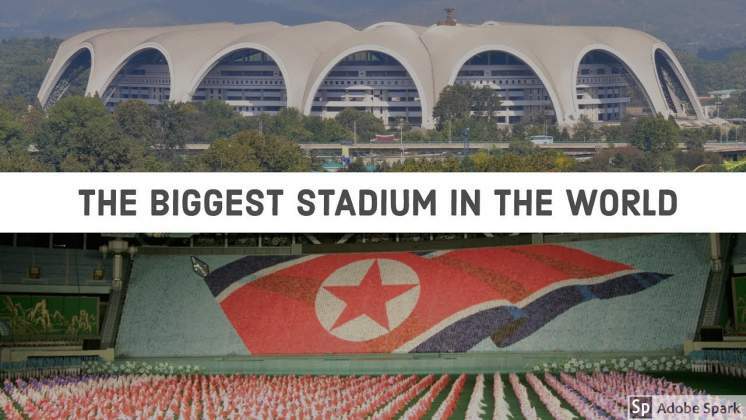 Located in Pyongyang, North Korea, it has the capacity to welcome around 150,000 spectators. The construction of this stadium was completed in 1989 and was used mainly for soccer games. However, it is more commonly used for mass games and athletic events now. The roof of this stadium features 16 curves which have been arranged like an enormous ring and the space floor is around 2.2 million feet, while the roof is over 197 feet from the ground. The second largest football stadium is found in Barcelona, Spain. It was previously known as Estadi del FC Barcelona until fans were polled to officially call it 'Camp Nou'. Ever since 1957, this stadium has been the home to Barcelona FC and is the largest football stadium of Europe. Costing around 288 million pesetas, it took around three years to complete the construction of this stadium. The stadium has a seating capacity of 99,354 people. It has also hosted popular sports tournaments like the 1992 Olympics and the finals of the UEFA Champions League. You can relive the atmosphere of another well-known football tournament by playing Football Champions Cup at Moon Games. As you play this football themed slot, you will face a field like display while balls, soccer shoes and jerseys roll as symbols! Found in Mexico City, Estadio Azteca is the third largest football stadium in the world. The construction of the stadium began in 1960 and was officially opened in 1966, and the home teams are Mexican National Team and Club America. It is also the first stadium to have hosted two World Cup Finals. It is also the venue that witnessed Diego Maradona's 'Hand of God' goal in the 1986 Quarter Finals. The name of the stadium has been carefully picked and it is a tribute to Mexico's Aztec heritage. Also, initially the stadium had a capacity of supporting 115,000 spectators but it has been reduced for safety measures. There are other large stadiums all around the world and some of these are Azadi Stadium (Tehran, Iran), FNB Stadium (Johannesburg, South Africa), The Rose Bowl (Pasadena, USA), Wembley Stadium (London, UK) and Gelora Bung Karno Stadium (Jakarta, Indonesia). Also, the 2018 FIFA World Cup will be hosted at the Luzhniki Stadium, which is the 15th largest stadium in the world, having the capacity to welcome 81,000 people. And, for the World Cup 2022, there's a stadium being constructed in Quatar, United Arab Emirates.